Robometricschool. - MIDE-51 and ISP Programmer are two software that you can use integrated to write program for microcontroller MCS51 like AT89Cxx and AT89Sxx and than you can continue to compile to file hex and continue to download your program to your microcontroller chips. You can write your program using assembly and also you can write your program with C language. In practice i usually use MIDE-51 software to write microcontroller program with assembly for MCS-51. I usually use instruction sets for MCS-51 when i write microcontroller program. To begin write assembly program we can open your MIDE software until appear view like figure 1. 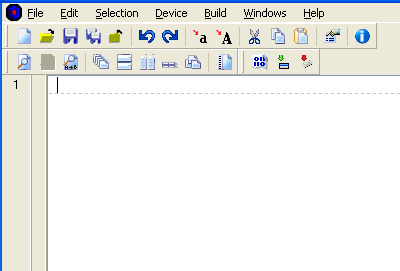 Click File-New until appear window like figure 2. We can begin to write assembly program in this window. After finish to write assembly for microcontroller program, we can save our program with extension .A51 like example program.a51. With this file we will can compile to hex file with burn it. For do it we can push menu Build and Burn like figure 3 bellow. When we burn this file in MIDE-51 software we also will know that your program is true or any error. MIDE-51 will show us where the error take place. So it will easy us to correct your program. Please follow step 1 until step 5 to insert hex file until finish download file to minimum system MCS-51. 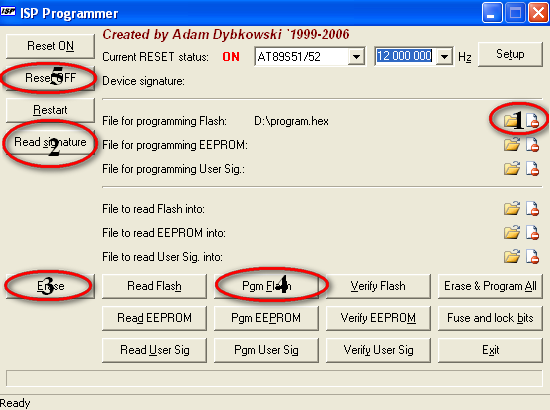 Note: when we push read-signature it will appear our microcontroller chip the we use. It will become if our connecting is true, but if our connecting is any something mistake it will appear FFFFFF or other. 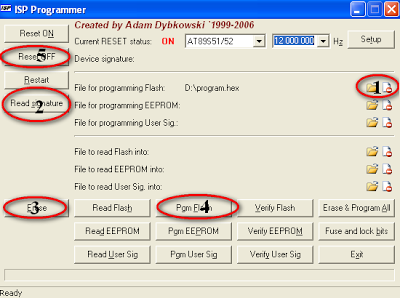 It is easy way how to use ISP PROGRAMMER to download your program to your minimum system microcontroller AT89Sxx. I hope you will easy to practice it.